Your new favorite crunchy breakfast has arrived! This breakfast treat is very similar to the crunchy muesli you get here in the Dutch supermarkets. Slightly healthier than the sugar-loaded commercial variety but surely several times tastier! 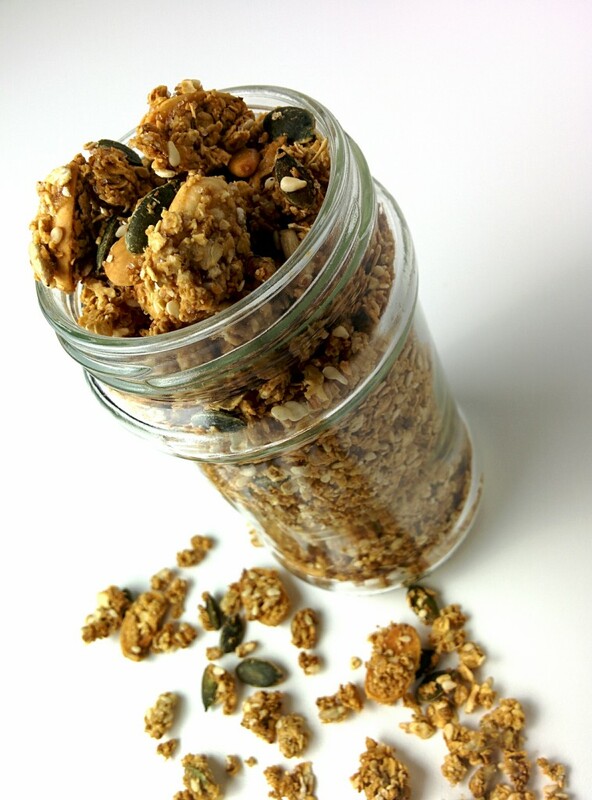 Make a big batch of this granola and start your day with some healthy fiber that will keep you going till lunch. You made too much and are afraid you can’t finish everything yourself? Give it away as a present to someone you like! The recipe is enough for 1 baking tray, which will give you about 2 jars of granola. Pre-heat your oven to 170° Celsius (fan/convection works best). Thoroughly mix all ingredients in a big bowl. Line a baking tray with parchment paper and spread mixture flat onto it. Bake for 20 minutes, turn mixture with two spoons to ensure everything browns nice and evenly. Bake another 20 minutes, maybe turning the granola once more, depending on how brown particular chunks get. Let the mixture cool completely, then store in airtight containers. Try to eat it within 2-3 weeks. This recipe was requested by @94mali after I posted the granola photo on Instagram. See something you like on my Instagram stream which is not yet on the site? Let me know and I will post the recipe here as well!